The ship was originally a "Missile Range Test and Instrumentation" platform, which sounds innocent enough. Really what this meant was that it was a platform to monitor for a Soviet Union Intercontinental Ballistic Missile Attack during the cold war. I would guess that there was all kinds of top secret hardware and things going on in that ship at one time. USAF was responsible for monitoring for this type missile attack, hence the reason why this was an Air Force Ship. You won't see many USAFS's out there. BobbyWombat thanks for the info! Yeah... I was wondering how USAF ended up with the Vanderberg. Here's a photo of a few of those Ears,that were part of the monitoring of Soviet Union. Looks like the Vandenberg was very well equipped with all kinds of listening/monitoring toy's. 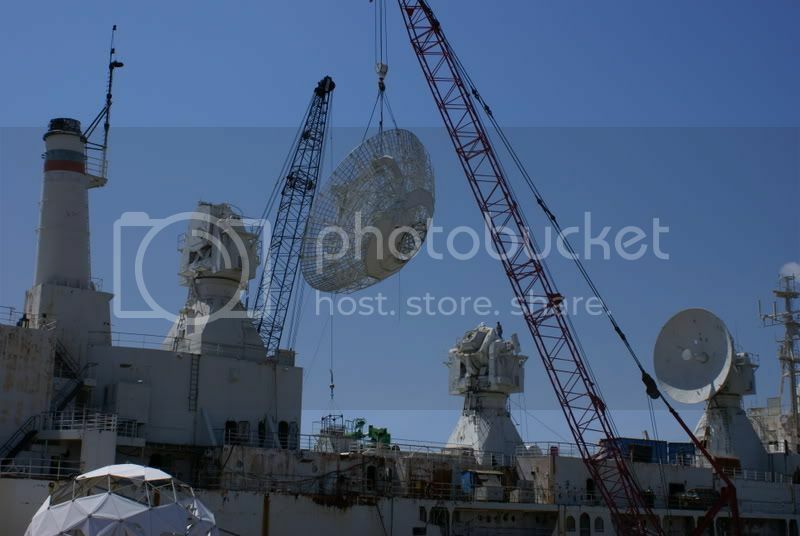 * Photo shows one of the dishes being removed,and taken off at the shipyard. They will be refitted on the ship as soon as all the work on the deck is complete.